The DWR website reveals which waters intrigue anglers. It’s a hot topic here in Utah: what are the best waterbodies to fish? Because we’re lucky enough to live in a state with so many good fisheries, it’s always an ongoing discussion amongst my coworkers and angler friends. Some prefer a serene spot where they can sit in a boat on a quiet lake all day, while others enjoy the hustle and bustle of a good fishing tournament. One of the perks of working in the Communications section at DWR is that I have quick access to things like web statistics. (If you’re nerdy like me, those sorts of things excite you.) We recently checked the traffic on the fishing portion of the DWR website. 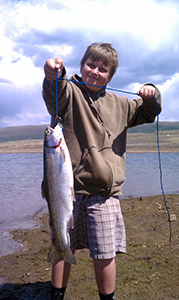 Joshua Root loves to get out and catch rainbow trout. 15. Mantua Reservoir. This is a place where you can catch fish easily from the shore or a boat. Mantua is located between Brigham City and Logan and it’s a good spot for bass, yellow perch and bluegill. A Mantua angler, Jack Rask, currently holds Utah’s bluegill record: an 11.5-inch bluegill that weighed 2 pounds, 7 ounces. 14. Currant Creek Reservoir. Currant Creek Reservoir is a beautiful, high-alpine water set in a huge valley with pines and aspen. Anglers love the reservoir’s abundant native cutthroat trout. The surrounding streams have cutthroat and brown trout and mountain whitefish. 13. Fish Lake. This lake is known for consistently producing big fish. Its crystal clear waters and high-alpine scenery make Fish Lake popular among anglers year round. Numerous introductions, both legal and illegal, have taken place over the years. The sport fishery currently consists largely of rainbow trout, splake, lake trout and yellow perch. 12. Lost Creek Reservoir. Secluded and easily accessible: these are some of the reasons Utah anglers come to Lost Creek. There are plenty of cutthroat and rainbow trout, too. This Morgan County reservoir is fished throughout the year. You're likely to catch a variety of fish at Flaming Gorge. Look at that view! 11. Mirror Lake. Surrounded by tall peaks and conifers, this high-elevation natural mountain lake lies just off the main highway. Anglers like to fish for rainbow and brook trout. Because there are so many surrounding camping options, groups of friends and families often make a multi-day trip of it. 10. Flaming Gorge. 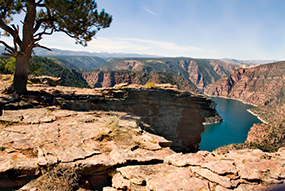 I don’t think any fishing hotspot list would be complete without the mention of Flaming Gorge. You’re likely to catch a wide variety of fish here, including kokanee salmon, lake trout, rainbow trout and smallmouth bass. You could catch brown trout, channel catfish and cutthroat trout, too. Because the Utah portion of the large reservoir is mostly in a canyon, it’s protected from the wind and provides a peaceful angling experience. 9. Scofield Reservoir. Scofield is one of Utah’s most popular trout fisheries, and for good reason. It seems there are always monster fish coming out of this Blue Ribbon fishery. 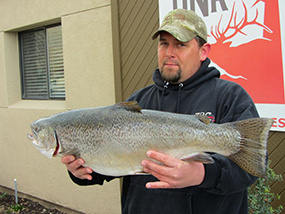 Chris Nilson recently caught the new state record tiger trout from Scofield: 18 pounds, 4 ounces. Scofield is an excellent spot to fish for trout year-round. Shore anglers love the easy access. Scofield is famous for its monster tiger trout. 8. Starvation Reservoir. This long, deep reservoir is set in a panoramic valley with a view of the south slope of the Uinta Mountains. But this fishery offers more than a picture-perfect backdrop. Anglers come here to catch walleye, yellow perch, smallmouth bass and brown trout. Nearby camp areas make it a good spot for a weekend outing. 7. East Canyon Reservoir. East Canyon is home to two current catch and release record fish: a 29-inch rainbow trout and 31.5-inch cutthroat trout. The big beaches and good fishing make it a fun spot to frequent during warmer months. If you visit this state park, you’re likely to catch rainbow trout and smallmouth bass. 6. Panguitch Lake. Panguitch has long maintained a reputation as one of the best trout producers in the state. It’s also an excellent place to ice fish. In fact, Panguitch is a Piute word meaning big fish. Whether floating, boating or fishing from shore, this lake offers consistently good fishing for large trout in a beautiful mountain setting. 5. Deer Creek Reservoir. Because of its easy access and proximity to the Wasatch Front, Deer Creek is a popular water for Utahns who love to boat and fish. You’re likely to catch a variety of species here, including largemouth bass, rainbow trout, smallmouth bass and walleye. A Deer Creek angler, Roy Montoya, currently holds Utah’s mountain whitefish record: 21.5 inches, and 4 pounds, 12 ounces. 4. Utah Lake. Utah’s largest freshwater lake is home to a variety of fish. At Utah Lake you’ll find channel catfish, bullhead catfish, common carp, black crappie, largemouth bass, white bass and walleye. The fish in the lake are not only diverse — many of them are also large. You can see launch fees and the best ways to access the lake online. 3. Rockport Reservoir. Rockport is a large lake situated on the Weber River between Kamas and Coalville. It’s a popular ice fishing spot, especially for perch enthusiasts looking to catch lots of tasty yellow perch. You’ll also catch rainbow trout, smallmouth bass, brown trout and tiger trout at Rockport. Lake Powell is a favorite for many Utah anglers. 2. Lake Powell. 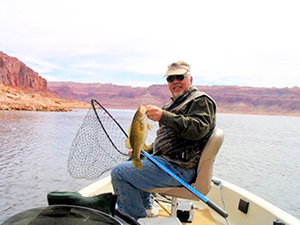 As Utah’s largest reservoir, Lake Powell is brimming with an assortment of fine fish. The red rock formations and desert landscape surrounding the lake are unrivaled for natural beauty. Head to Powell to catch stripers, smallmouth and largemouth bass, crappie, channel catfish, bluegill, common carp and green sunfish. Check the detailed fishing report before heading out. 1. Strawberry Reservoir. Strawberry squashed the competition in regards to online page views. As Utah’s premier cold-water fishery, this Blue Ribbon hotspot is full of fishing opportunities all year long. The reservoir holds large cutthroat trout, rainbow trout, kokanee salmon and smallmouth bass. In fact, the current record cutthroat trout (26 pounds, 12 ounces) and record kokanee (6 pounds) came from Strawberry. So, did your favorite fishing spot make the list? Although they’re all great places, some of these results surprised us a bit. I can tell you that my husband (an avid fly angler) wouldn’t agree with this list. He prefers to fish the nooks and crannies of rivers that don’t typically see a lot of fishermen. Let us know where you like to fish and whether you prefer floating, boating or casting from shore. Stay tuned and we’ll post the results from the latest angler survey showing which waters you actually frequent the most. one of my favorites is a creek, where you catch natives and a brown once in awhile. you seldom see anyone fishing this creek and the best fishing is where you have to walk into a roadless area. all nine of my Grandkids caught their first fish on this creek. I always catch my limit, get some good exercise and see some beautiful scenery. This creek is never stocked with hatchery fish in this area. It’s in Sevier County but I think I’ll keep it a secret. Will they ever put Tiger trout in Strawberry? It seems that they would grow to tremendous size. I would much rather catch a huge tiger than a rarely seen rainbow? Hi John, thank you for inquiring. There are lots of opportunities for you to share your opinions with our biologists on this topic. There are a few steps to take (the same ones you’d take to make any kind of wildlife management change) within the region. Attend the fishing open houses in the spring (likely to be held in April and May), participate in the online survey and plan to attend the RAC meeting on Sept. 17 as well as the board meeting on Nov. 7. You are welcome to get in touch with the aquatic biologists — Alan Ward and Justin Robinson — at Strawberry for additional details. The Strawberry River below the Soldier Creek Dam would have to be my all time favorite water to fish. I don’t often get there but when I do the trip is always a memorable one. Lots of big Browns, not a river for those without the patience to really work the rod and fly. Why aren’t lake trout or mackinaw planted in strawberry. It is deep enough, big enough, and has plenty of food. I would like to know if there is a reason why Strawberry couldn’t support lake trout. I believe that mackinaw would be able to grow huge and quickly. Any feedback of why strawberry could not support them would be appreciated! In the blog you noted that the current Utah cutthroat catch-and-release record was caught at East Canyon Reservoir, 31.5 inches. It seems to me that on the site for East Canyon, you should include under “Possible Catch”, Cutthroat Trout. There are native cutthroat trout in most northern Utah reservoirs, including Rockport, Deer Creek and Jordanelle, but their sites don’t indicate such. If we want to preserve the native Bonneville cutthroat trout in their native range, it seems to me that they should be listed in all the reservoirs where they are found to increase angler awareness. I hope those lucky enough to catch them would appreciate their rarity and release them. Thanks for the blog.